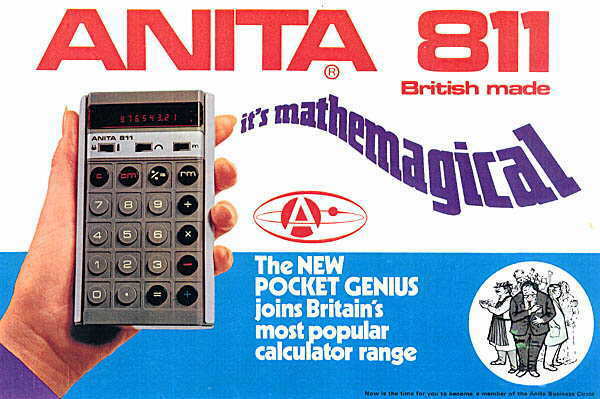 On this page are old advertisements and sales brochures for Bell Punch and Anita calculators. 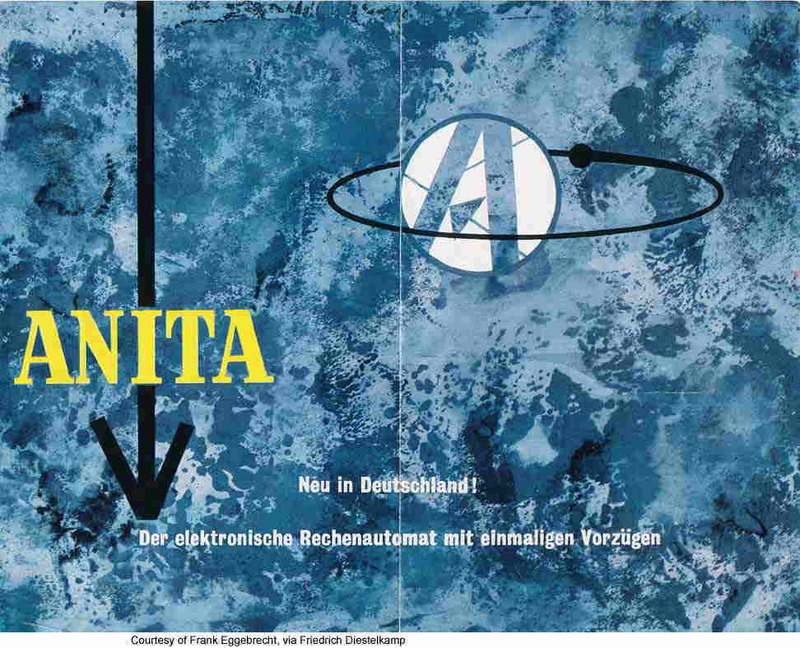 The advertisements show the changeover from the mechanical calculators to the electronic Anita models, and their development and reduction in size. 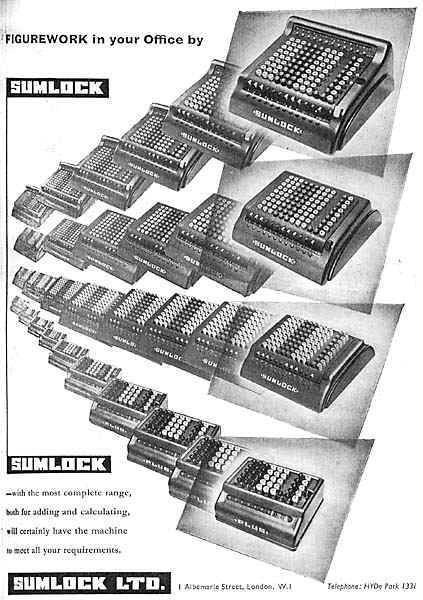 Sumlock Adding-Calculating Machine (pdf format), about 1947. 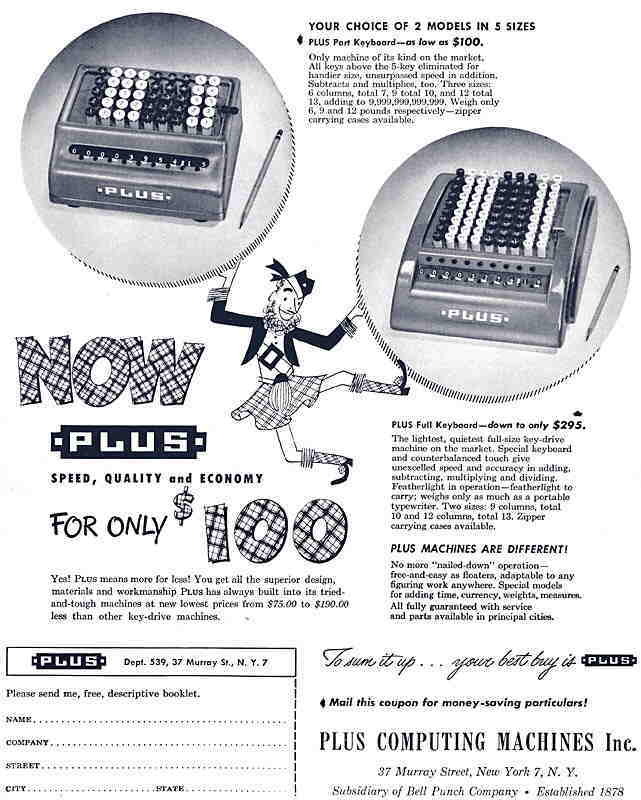 Plus Adding Machine (pdf format), about 1948. 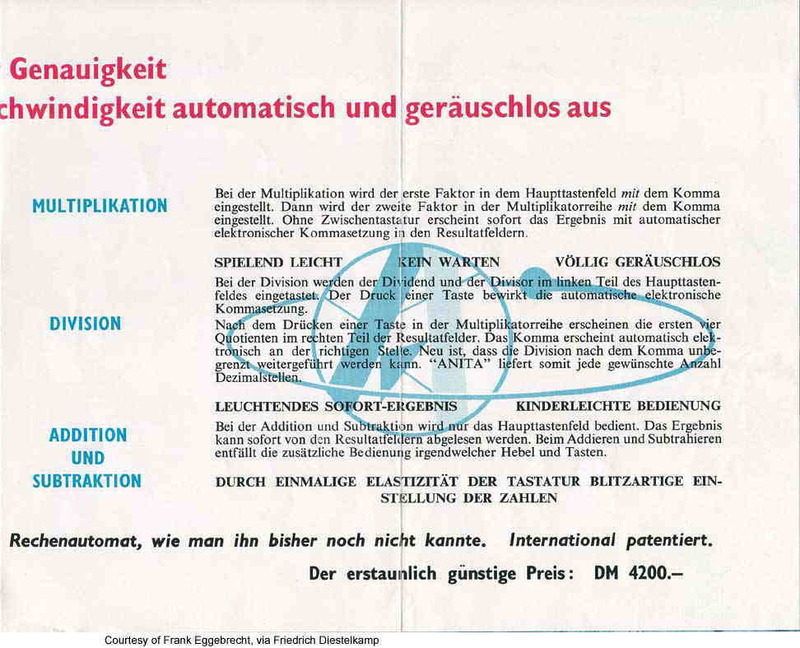 Anita Mk VII - (German language) Front, p2, p3, rear. Anita Mk 9 (Mark IX) - p1, p2, p3, p4. 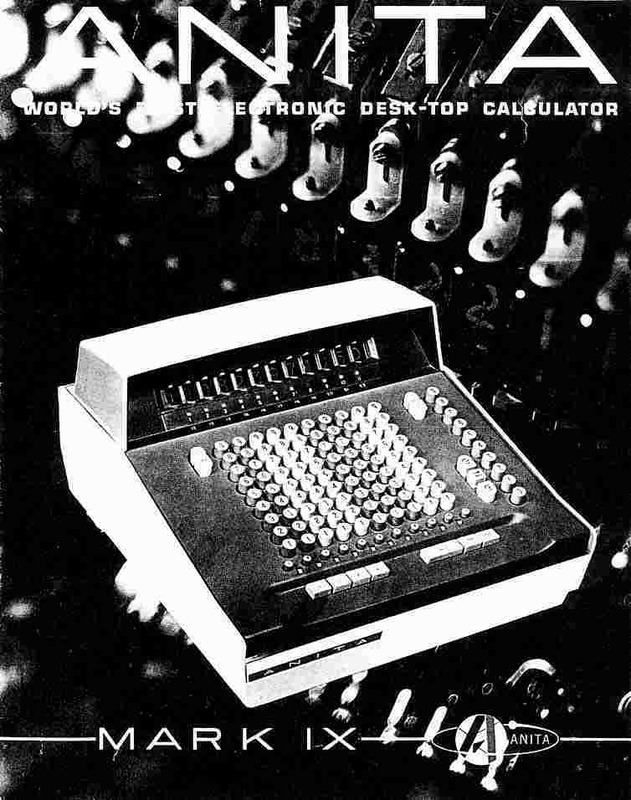 Calculators & Computers - (pdf format) - Sales brochure of the Yugoslavian company Elektronska Industija, which obtained the design and the production facilities of ANITA calculators around 1976. Calculators start at p14. 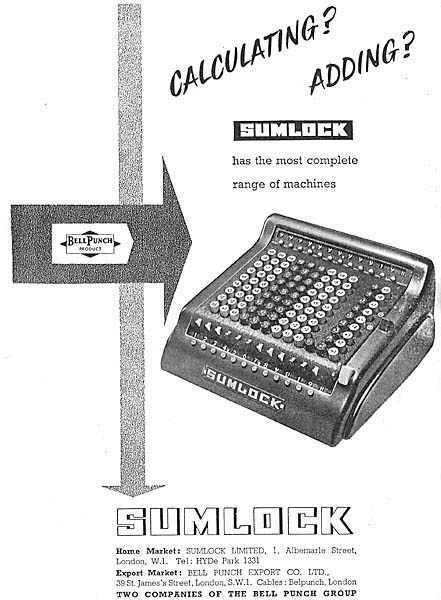 November 1941 - Plus Adding Machines, Sumlock Calculators. 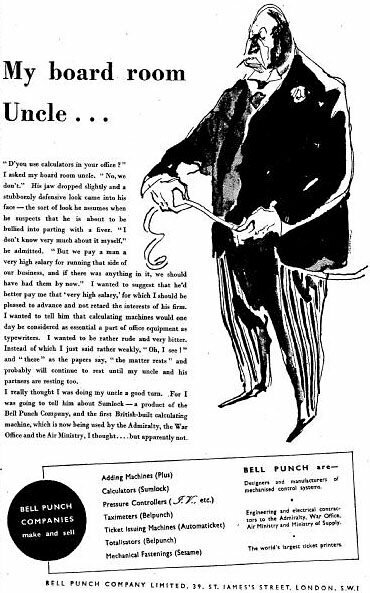 "Bell Punch Companies Make and Sell". 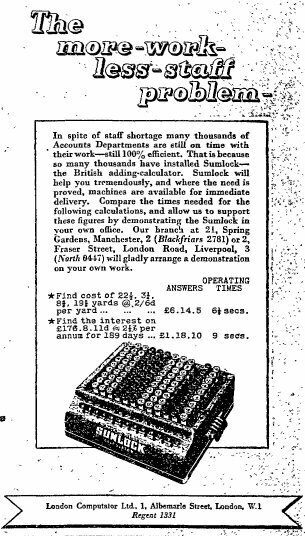 April 1943 - Sumlock, "The more-work-less-staff-problem". Autumn 1949 - Plus, "Now Plus for only $100". 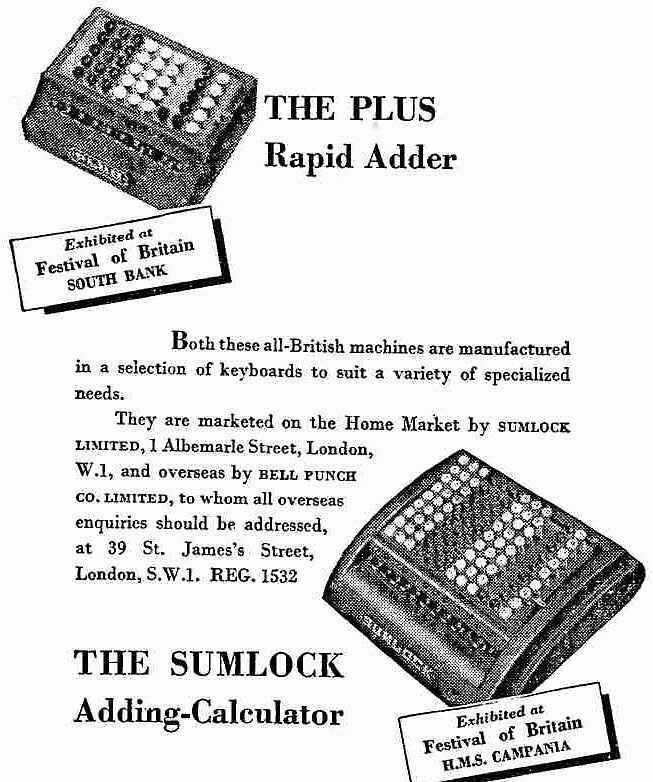 August 1951 - "The Plus Rapid Adder. 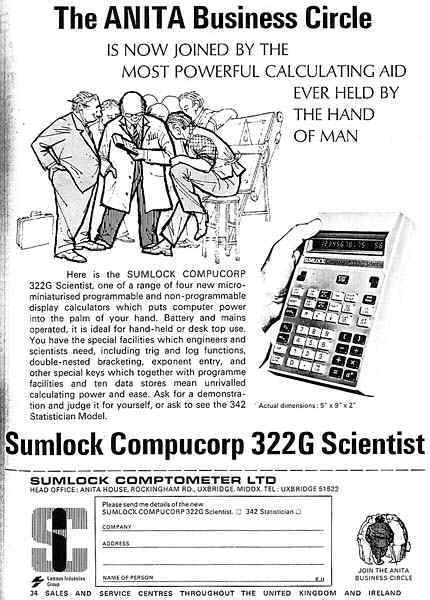 The Sumlock Adding Calculator". 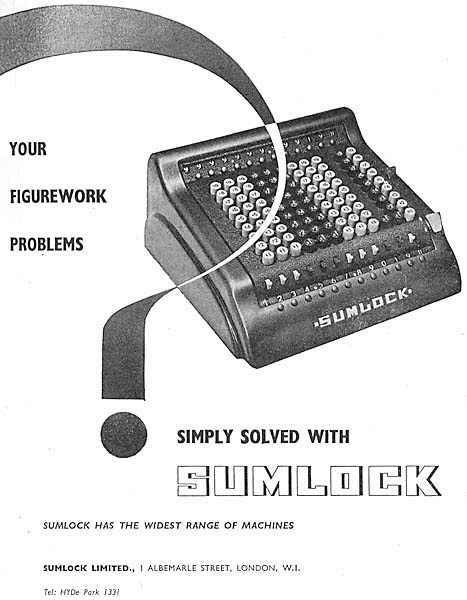 January 1957 - Sumlock, "Your figurework problems simply solved with Sumlock". 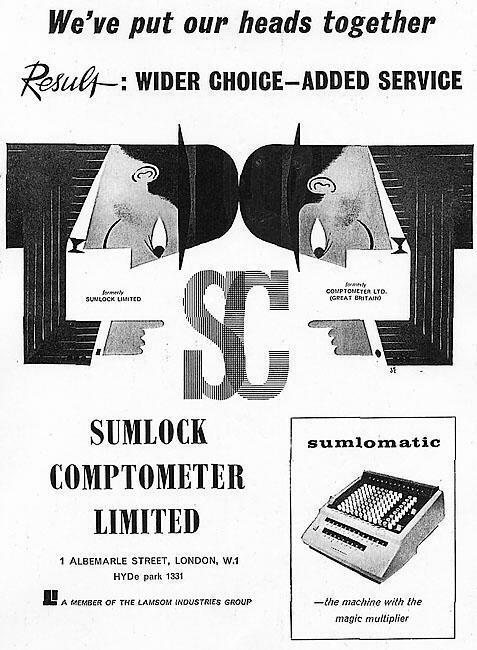 April 1957 - Sumlock, "Sumlock has all the answers to figurework in your office". 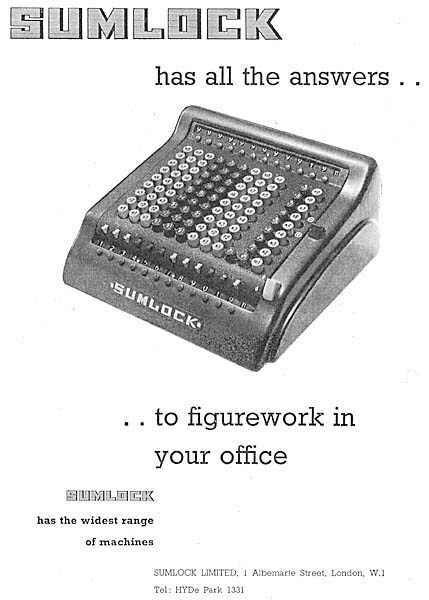 May 1957 - Sumlock, "Figurework in your Office by Sumlock". 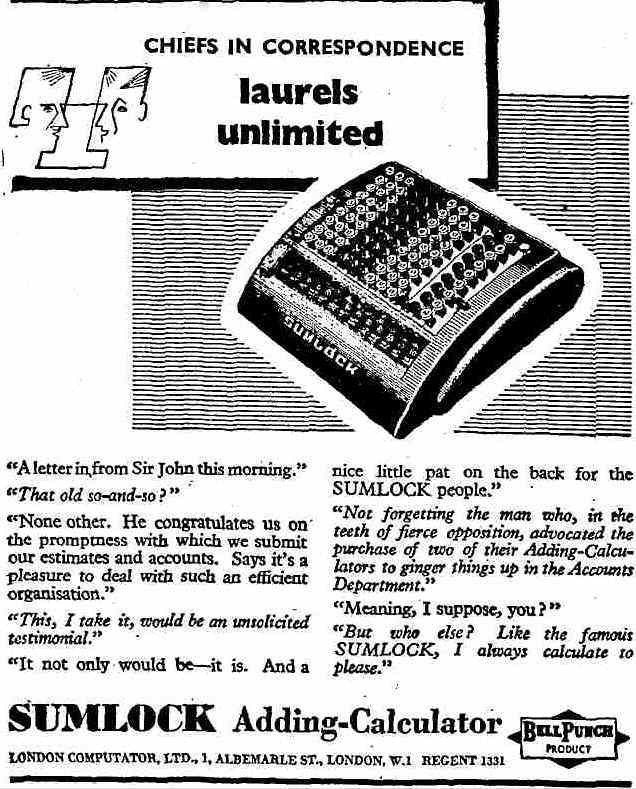 September 1957 - Sumlock, "Calculating? Adding? 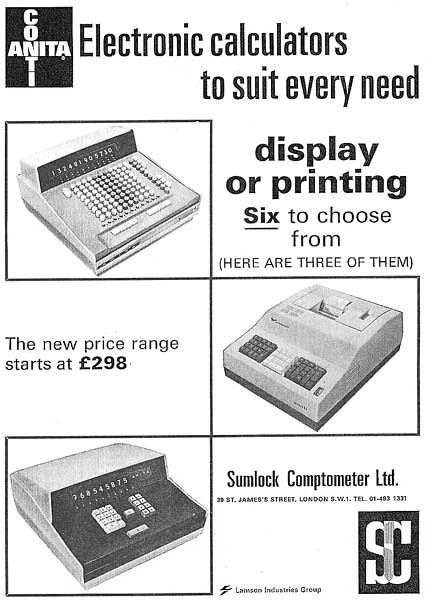 Sumlock has the most complete range of machines". 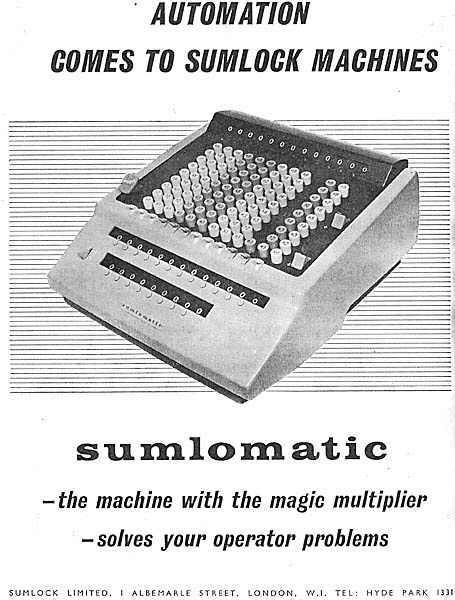 June 1959 - Sumlomatic, "Automation comes to Sumlock machines". 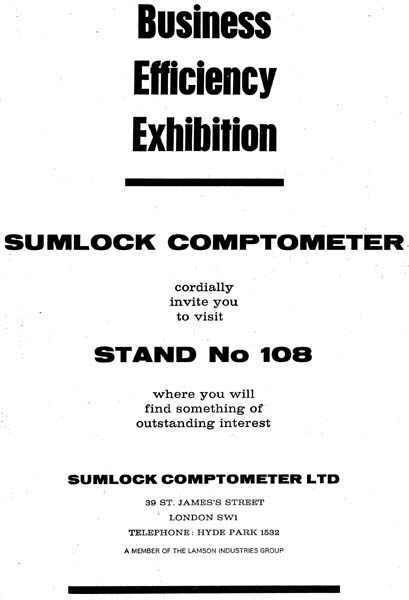 January 1961 - Sumlock Comptometer, "We've put our heads together" - The amalgamation of Sumlock Ltd. and Comptometer Ltd. (Great Britain). 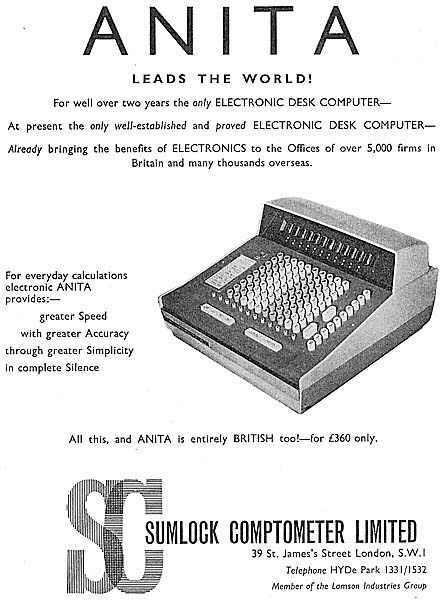 October 1961 - Anita Mk8, "Visit Stand 108 where you will find something of outstanding interest" - A tantalising invitation to the Business Efficiency Exhibition in London and the launch of the ANITA, the world's first electronic desktop calculator. 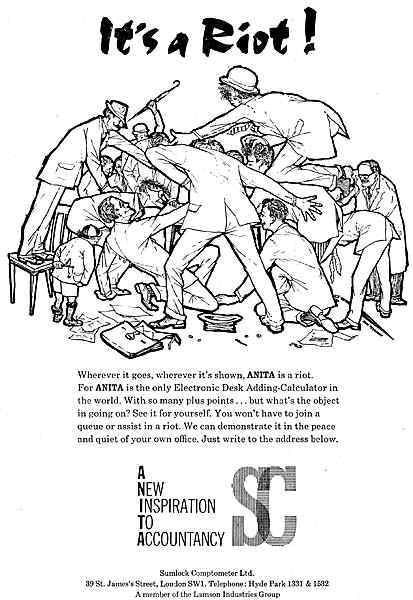 January 1962 - Anita Mk8, "Its A Riot - A New Inspiration To Accounting". 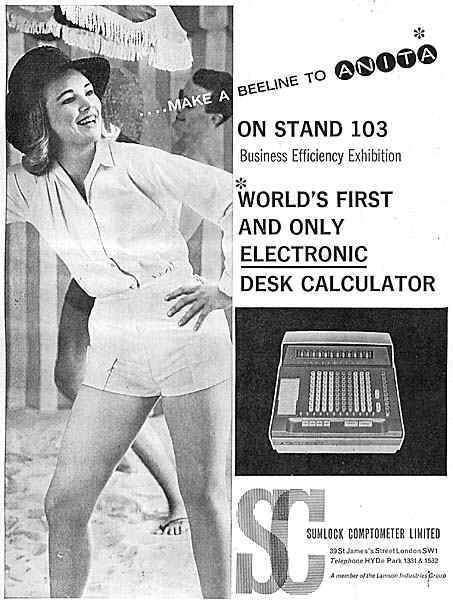 September 1962 - Anita Mk8, "... Make a beeline to ANITA: World's first and only electronic desk calculator", on stand 103, Business Efficiency Exhibition. 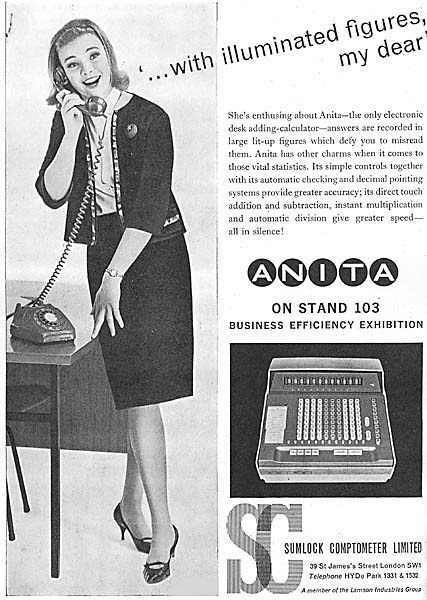 October 1962 - Anita Mk8, "... with illuminated figures, my dear", ANITA on stand 103, Business Efficiency Exhibition. 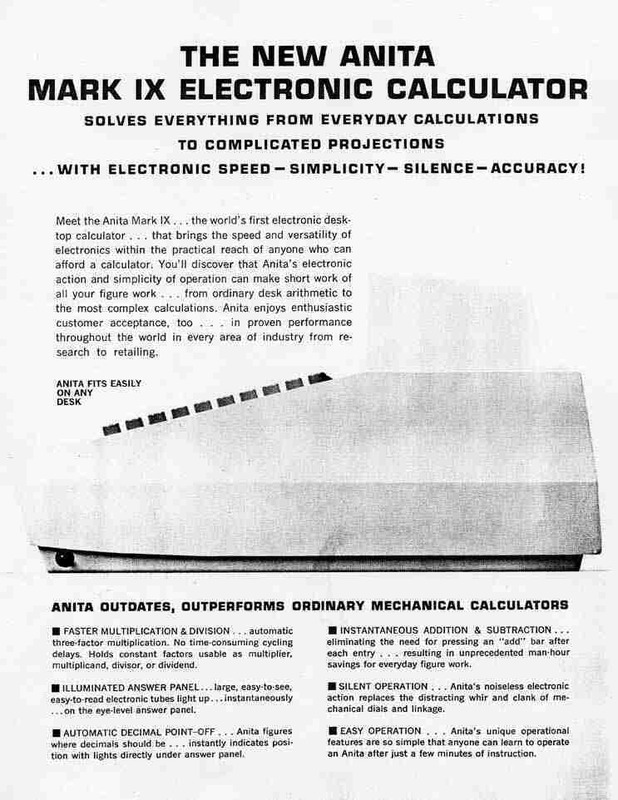 October 1962 - Anita Mk8, "The first electronic Desk Calculator in the world! 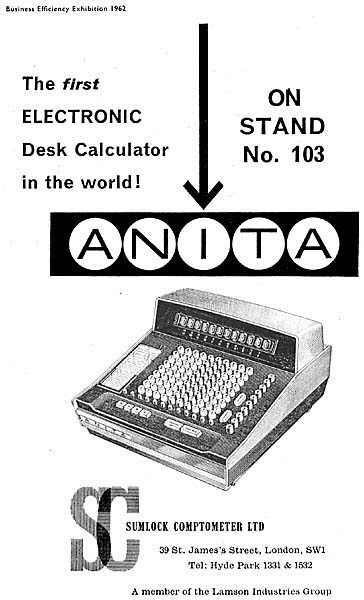 ", ANITA on stand 103, Business Efficiency Exhibition catalogue. 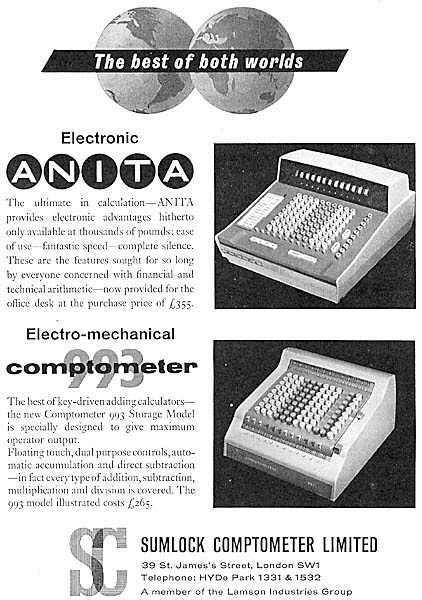 May 1963 - Anita Mk8 & Comptometer 993s, "The best of both worlds", price of Anita Mk8 �5, Comptometer 993s �5. 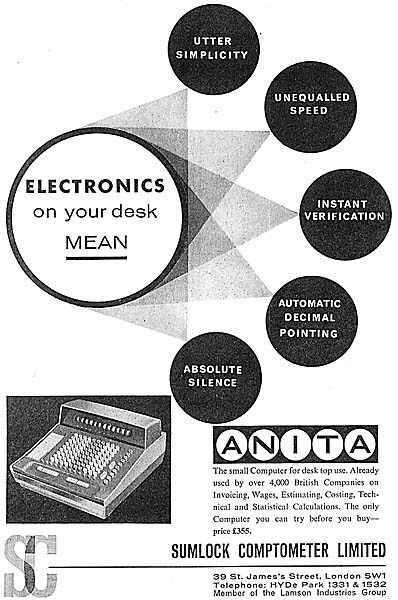 January 1964 - Anita Mk8, "Electronics on Your Desk Mean Anita" (note that it is called a "small computer for desktop use"), price �5. 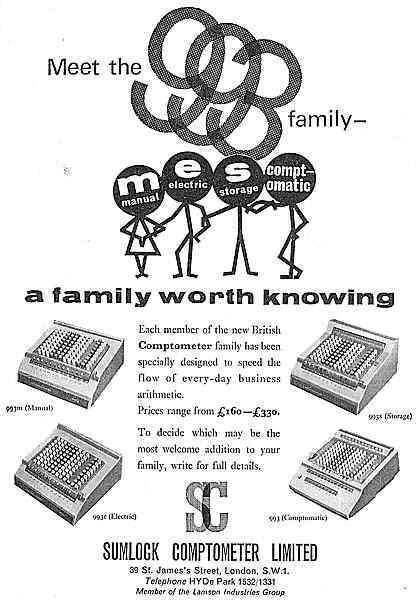 February 1964 - Sumlock Comptometer 993 Series "Meet the 993 Family", price range �0 to �0. 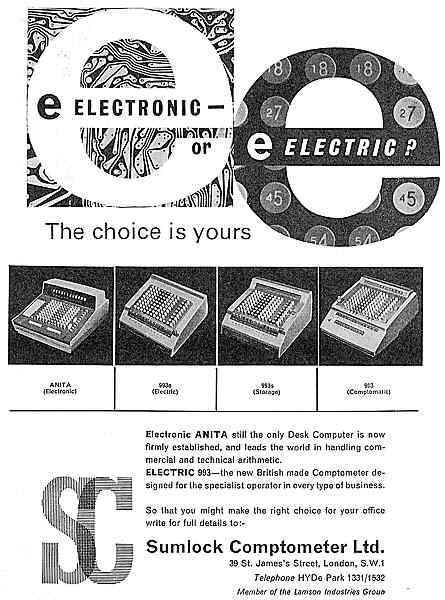 March 1964 - Anita Mk8 & Sumlock Comptometer 993 Series "Electronic or Electric" (note that the Mk8 is "still the only Desk Computer"). 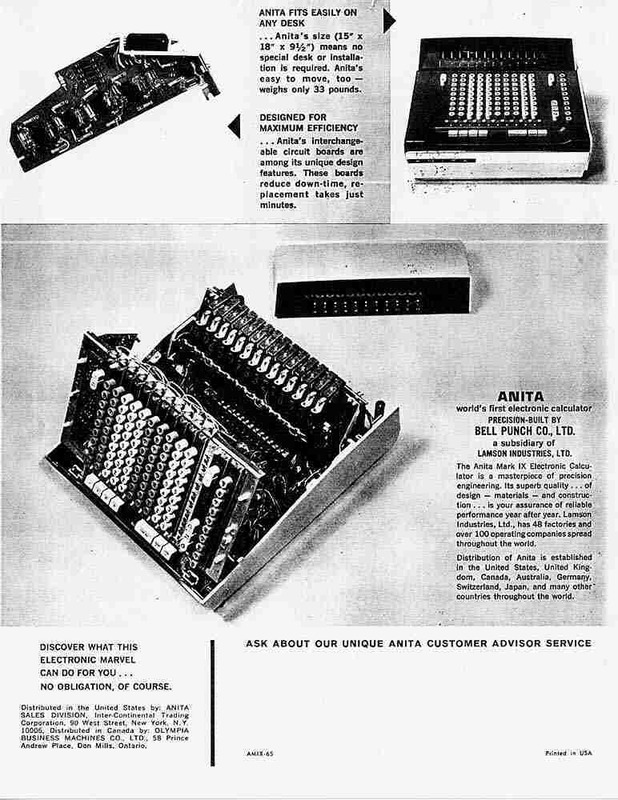 June 1964 - Anita Mk8, "Anita Leads the World". 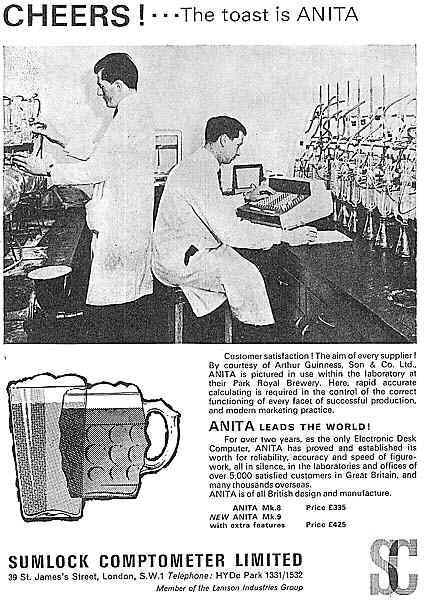 January 1965 - Anita Mk8 & Mk9, "Cheers! ... The Toast is Anita", prices: Mk8 �5, Mk9 �5. 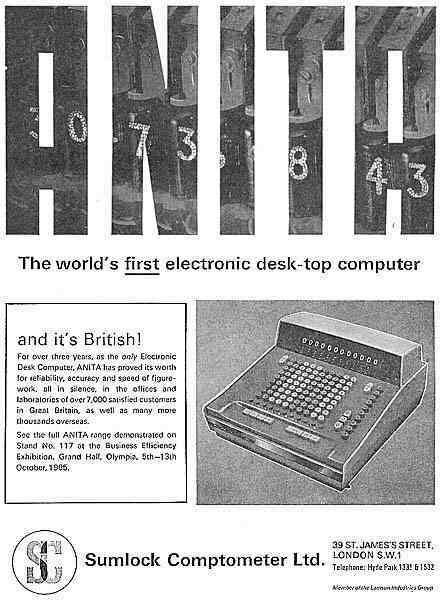 October 1965 - "Anita - The World's First Desk-Top Computer". 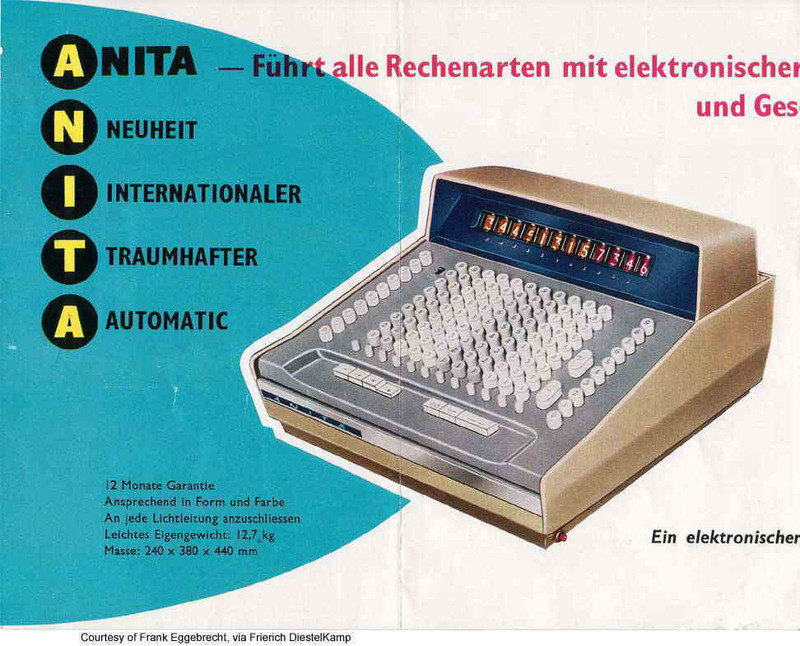 November 1965 - Anita Mk9, "Anita Leads the World", price �5 (note that the Anita was introduced in January 1962 and more than 16,000 are in use throughout the world). 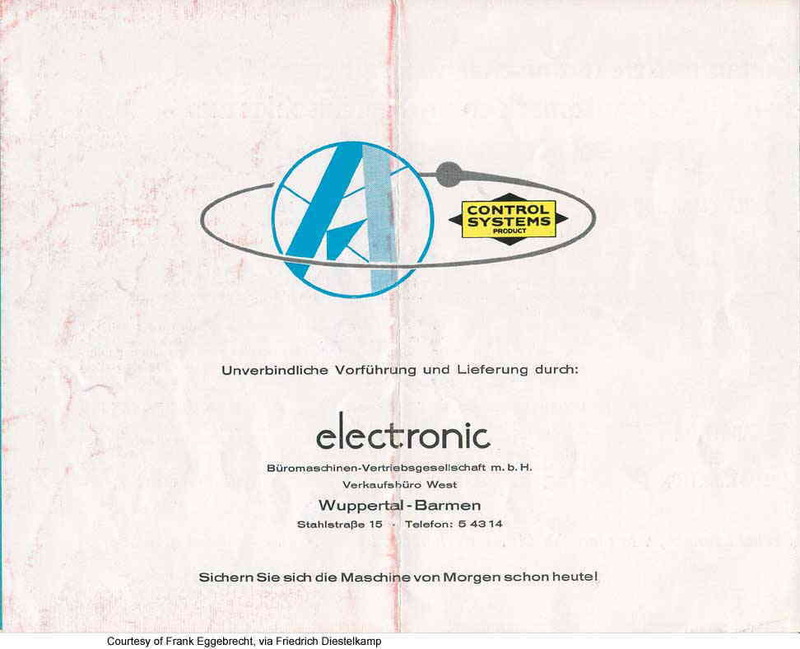 March 1965 - Anita Mk8 & Mk9, "Elections, Electronics and TV". 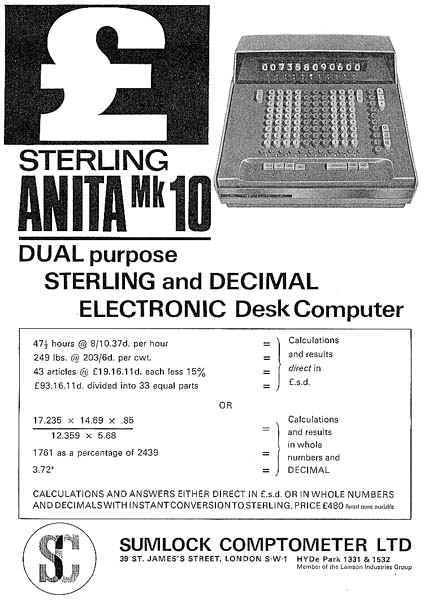 January 1966 - Anita Mk10, "Dual Purpose Sterling and Decimal Desk Calculator". 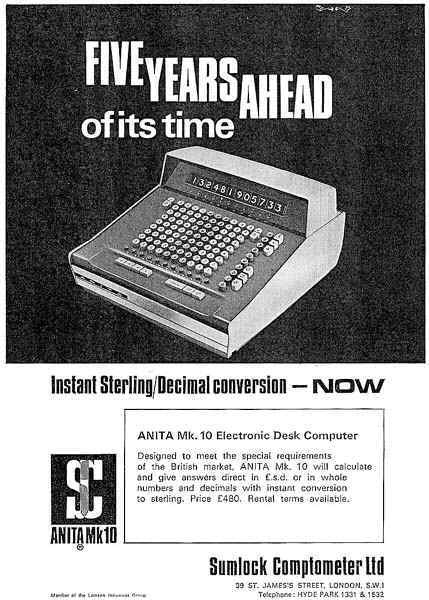 July 1966 - Anita Mk10, "Five Years Ahead of its Time", for currency calculations in the British market, then in the old d currency and would convert to decimal currency on February 15th 1971. Price �0. 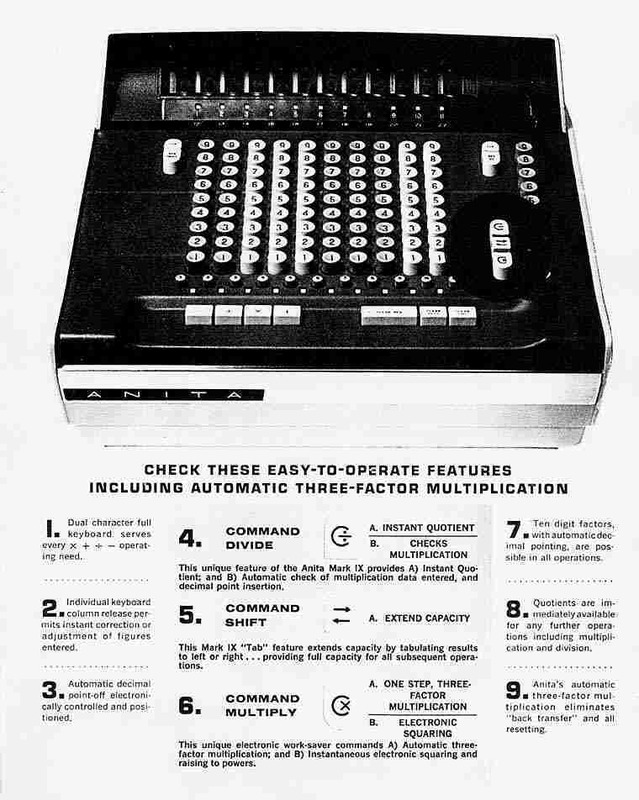 October 1966 - Anita Mk12, "Now Anita Mk12". 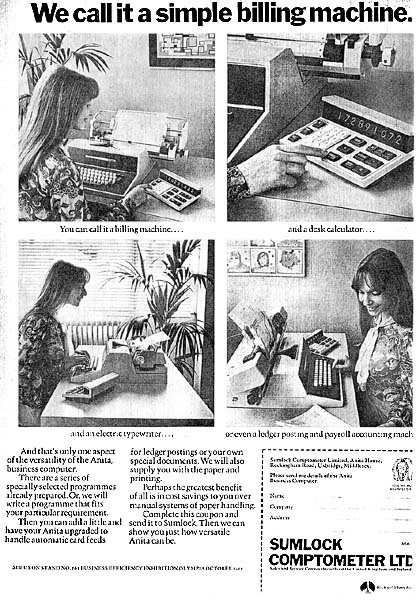 January 1968 - "Electronic Calculators to Suit Every Need". 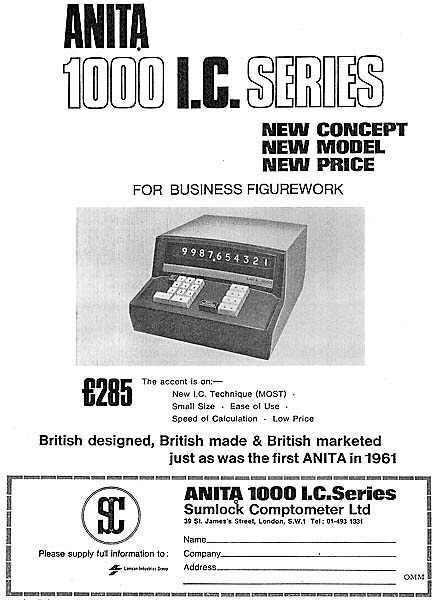 June 1968 - "Focus on ANITA", prices for the ANITA Mk9, Mk10, Mk11, Mk12. 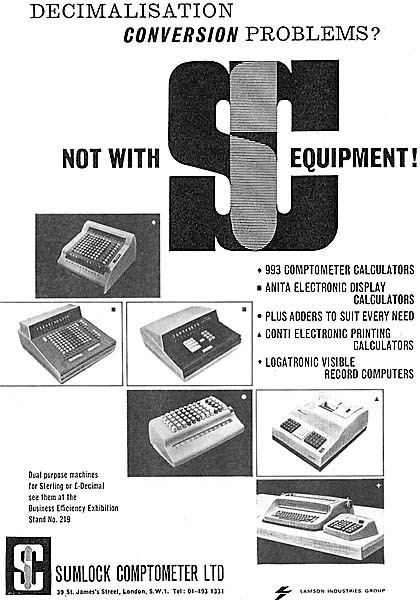 October 1968 - "Decimal Conversion Problems - Not with SC Equipment". 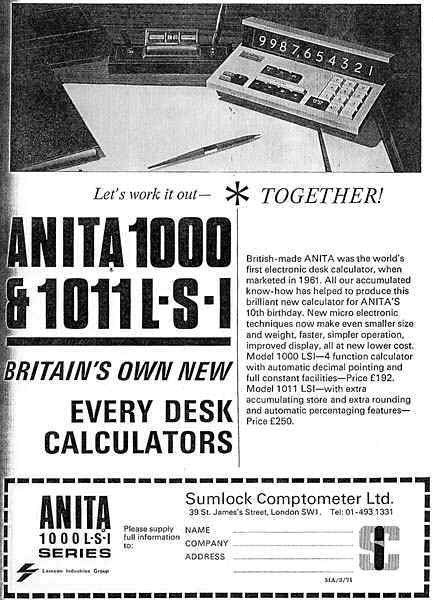 April 1969 - Anita 1000, "Anita 1000 I.C. Series", price �5. 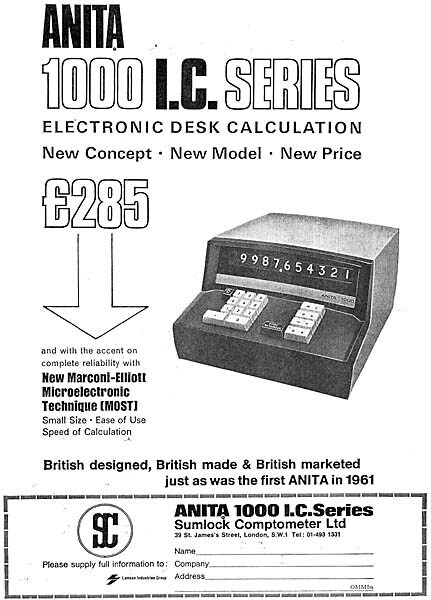 May 1969 - Anita 1000, "Anita 1000 I.C. Series", price �5. 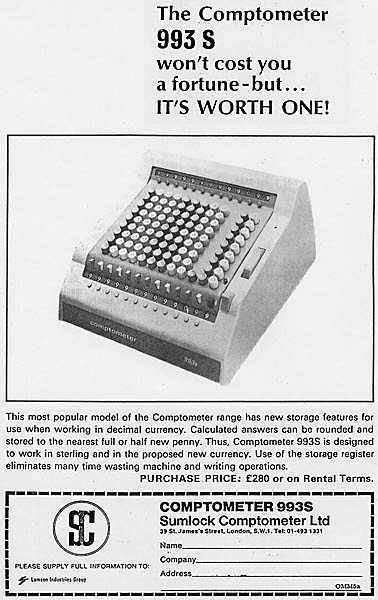 May 1969 - Comptometer 993S, "Won't cost you a fortune - but its worth one". 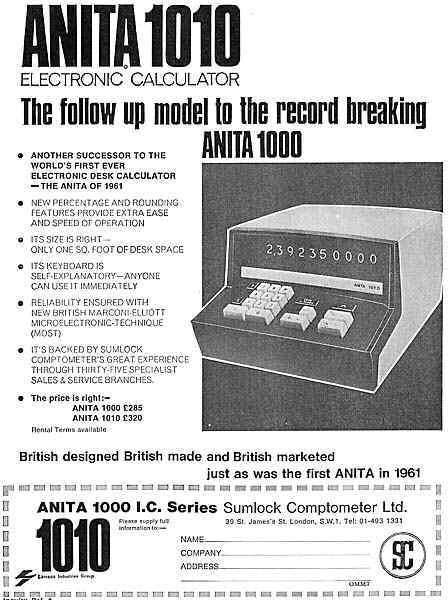 July 1969 - Anita 1010, "The follow up to the record breaking Anita 1000", price �0. 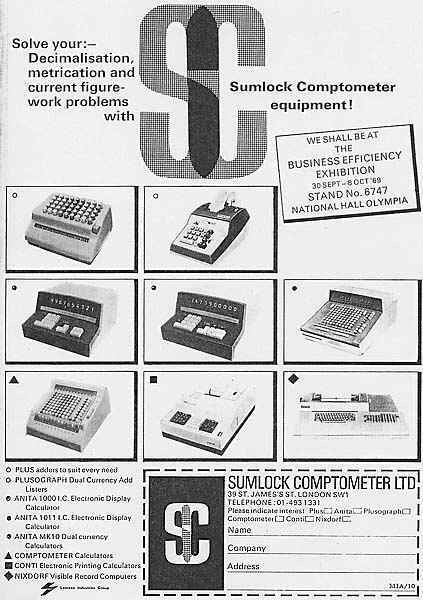 October 1969 - "Solve your decimalisation, metrication and current figure-work problems with Sumlock Comptometer equipment". 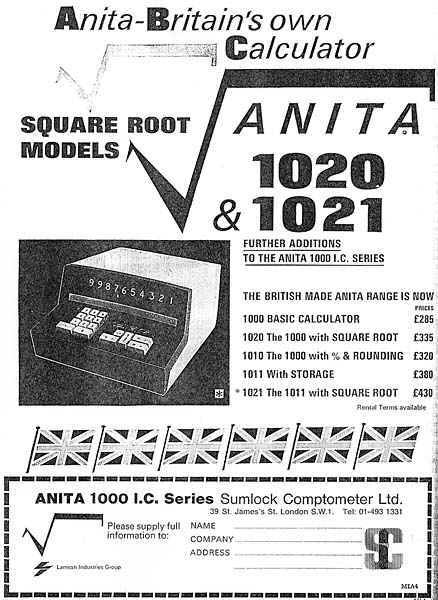 April 1970 - Anita 1020 and 1021, "Square root models". 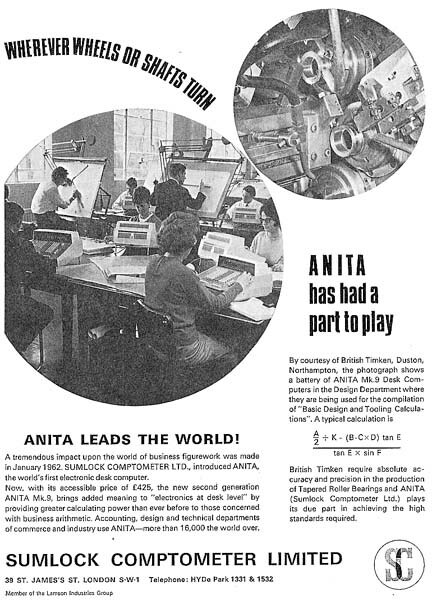 January 1971 - Anita 1011P, "Anita goes to print". 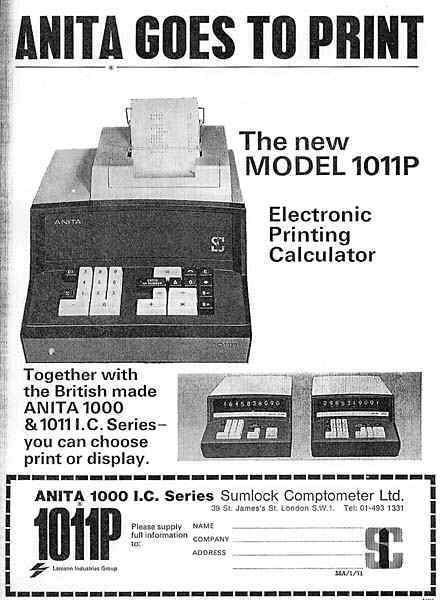 February 1971 - Anita 1000LSI and 1010LSI, "Britain's own new every desk calculator", prices �2 and �0. 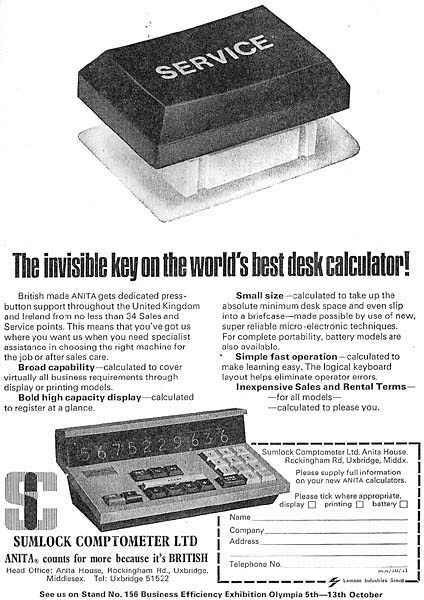 October 1972 - "Service - The invisible key on the world's best desk calculator". 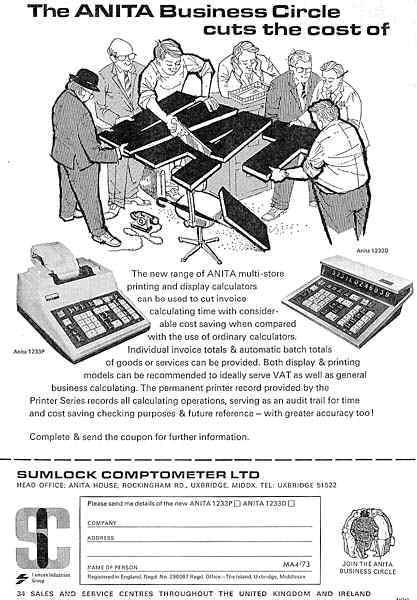 November 1972 - Sumlock Compucorp 322G, "Anita Business Circle". 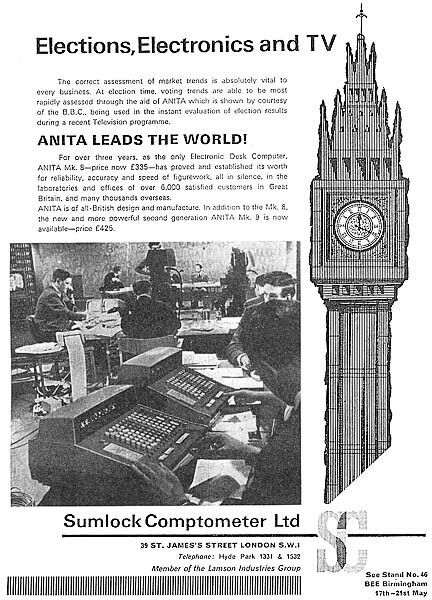 February 1973 - Anita Business Computer and Anita 1233P, "Anita Business Circle". 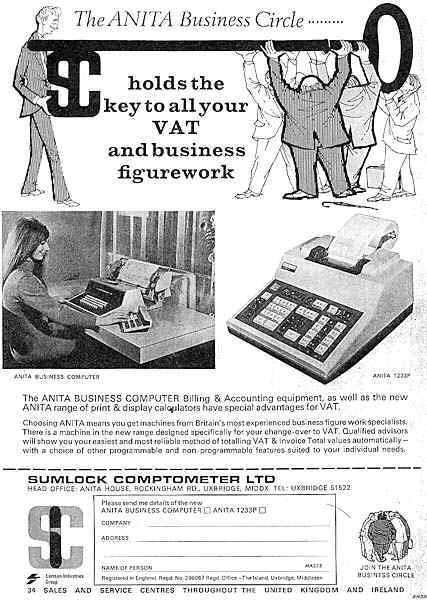 April 1973 - Anita 1233P and 1233D, "Anita Business Circle cuts the cost of VAT". 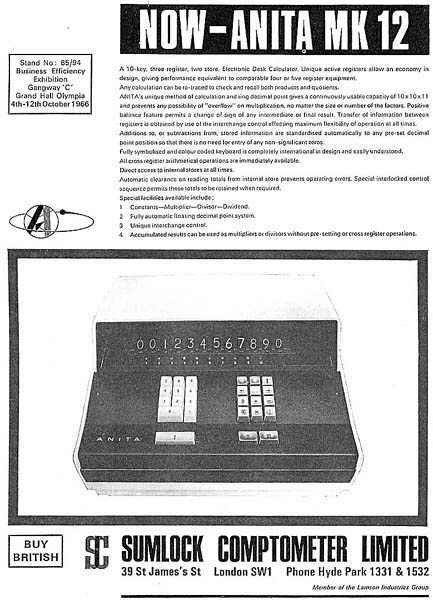 October 1973 - Anita Business Computer, "We call it a simple billing machine".